Gramola doesn’t require you to have anything else than the NodeJS runtime to execute. You don’t need a database (other than Sqlite, managed by Gramola, and kept in a single file), you don’t need a standalone web server. Gramola’s memory footprint is small enough to run on a Raspberry Pi comfortably. If there’s something true about ID3 tags is that they are most of the time wrong. We thing relying on them to sort your music collection is not a good idea. You know how your music is sorted in files and folders, and Gramola won’t mess with that. Do you have a huge music collection? So do we. And we think a music player should be able to handle them. 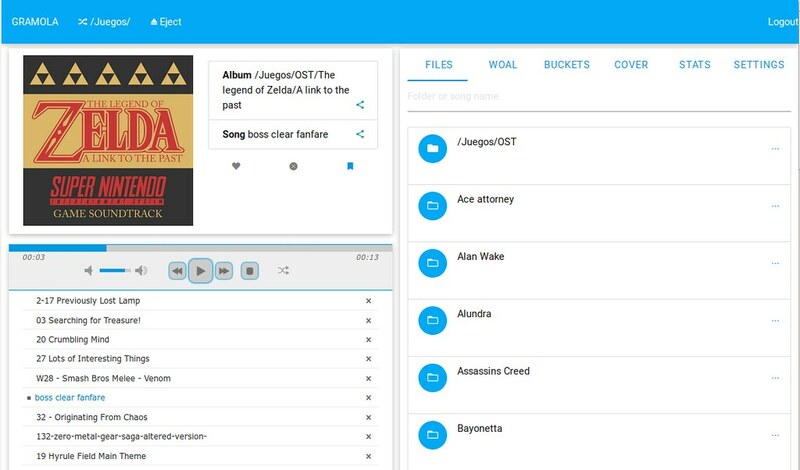 Gramola won’t take more than a couple seconds to index several gigabytes of music, and searches or other features will be snappy as well. Gramola will look neat and be functional no matter your screen size, even on mobile browsers. Filter songs and directories in your collection matching a search term. And it’s really quick! You can tag your songs in arbitrary “buckets” (for instance: “party”, or “songs from my teens”). Two buckets come by default: Favourites and blacklist. Blacklisted songs won’t come up on infinite modes, but you can still add them manually to your playlist. Pick a folder at any level in your directory tree, and start a random session that will autopopulate the playlist with songs down in the tree as you go along. You can also start infinite mode from a bucket. Share songs and folders using a shortlink parameter (e.g: ?l=29). 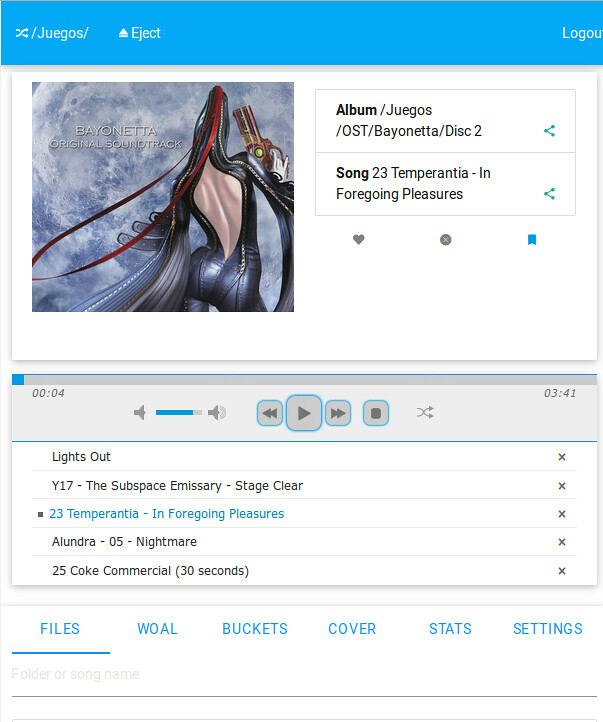 Anyone with the link will be able to reach the song, even if it’s not a user in your Gramola instance. The songs others are listening to are recorded in the system, so you can see what they are listening in your server. If you activate desktop notifications you will get a popup everytime the song changes. If you have any album covers on your local collection, Gramola will display them in a slideshow. If you haven’t, Gramola will fetch them from Google, and allow you to download them locally to your collection.